A sink skirt is often used to cover exposed plumbing or unsightly storage space. Although they were once common in kitchens, now sink skirts are more popular in bathrooms. Sink skirts are popular with renters who cannot permanently change their surroundings as well as homeowners who are not yet ready to tackle the interior design for their bathroom. People who like an old fashioned or country appearance in their kitchen or bathroom also prefer them. Small bathroom designs also often make use of a sink skirt to create more storage space beneath the sink. Elegant bathroom designs that already use a lot fabric may be enhanced by adding a sink skirt. Conversely, a minimalist bathroom may look ridiculous when a traditional ruffled covering is added to the pedestal sink. Choosing a sink skirt may be difficult due to their limited popularity. The best approach is to shop online, at least initially, to get a better understanding of the styles and colors available. When picking a covering, consider these basic factors. Check to make sure that the fabric can easily be laundered. Sink skirts will get dirty often: a material that is easily cleaned and requires little ironing can save significant time over the year. Look for stain resistant fabric. A fabric that is treated to reduce stains is a necessity, especially in a kitchen. Consider the method of attachment. Some sink skirts come with double sided tape to stick it to the sink, which may be impractical for a high humidity area such as a bathroom. Look for substitute sink skirts. If you would like to use a rod to attach your sink skirt, you could also look for curtains of an appropriate size instead of a traditional covering. In this case, try to fit the width requirement: if the curtain is too long it can be hemmed with adhesive hem tape. While there are many options available for sink skirts, making your own covering gives you unparalleled choice regarding the style, fabric, and pattern. These coverings are fairly easy to make and require little sewing. For homeowners who wish to avoid sewing entirely, the seams can be made with adhesive hem tape.To make the sink skirt, measure the width of the area you wish to cover as well as the distance between the sink and the floor. Add 1 inch to these measurements for a hem allowance. If you desire a fuller sink skirt, be sure to increase the width of the covering by at least fifty to seventy five percent to allow for gathering. Cut the rectangle out of fabric and create a hem using hem tape or a sewing machine. The most difficult part will be choosing a method to attach the sink skirt to the sink. For this purpose, suction cups may be used, or even adhesive velcro. It is also important to account for excess humidity that may cause the attachment method to fail over time when choosing. A rod around the sink can also be used. In this case, the sink skirt functions just like a small curtain over the areas underneath the sink that should be hid. If this method is used, a casing at the top of the curtain should be created to facilitate hanging. Sink skirts are an easy way to cover an unfortunate pedestal sink or conceal extra storage space. However, this does not mean that they will fit with the existing interior design in your kitchen or bathroom. 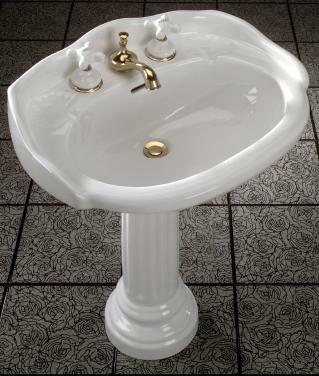 Contemporary styles may make it difficult to find a suitably styled sink skirt, making it prudent to examine other options of concealment or decoration.